Terry Chinnery continued his efforts in developing young baseball players, when he recently assembled more than 20 of his 13-19 year old players on the E. Walwyn Brewley Softball Park, to demonstrate their skills so that Georgia Academy of Hope Coach Gene Reynolds, could see first hand the available raw talent in the territory. Reynolds said he and Chinnery had been trying to arrange the session for a while before a slot opened for him to come down. He said he was looking at Chinnery’s players with an eye toward opportunities for getting an education, using baseball as the tool. 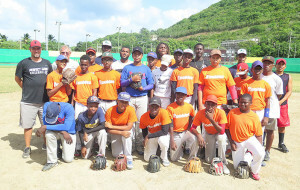 Although the British Virgin Islands doesn’t have a baseball history, tradition or dedicated playing field, Reynolds said his academy has been bringing students to the United States for several years to try and obtain collegiate scholarships or possibly drafted by Major League Baseball—if that happens for them. 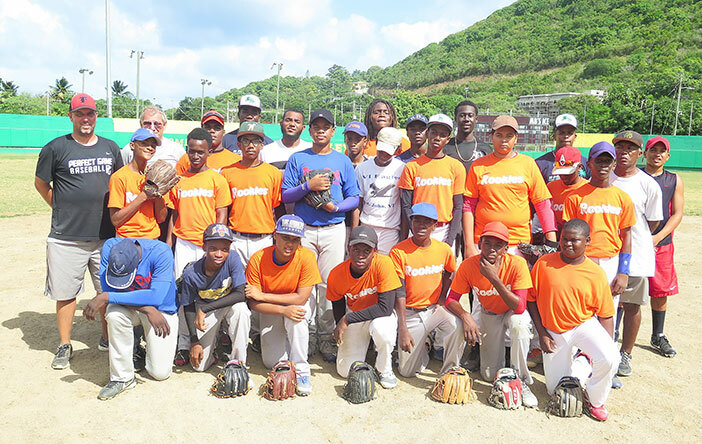 Reynolds, who was drafted by the Colorado Rockies, said he’s not surprised by what he saw in the BVI because he has been so several places with a similar structure and did something similar in the Bahamas, where players worked out on a softball field. He said about three year ago they started bringing Bahamian players to his academy, and one player on his team was drafted by the Toronto Blue Jays. He said he has seen some strong infielders, like Sampson and Smith and Liburd who are catchers; Cedeano is a pitcher and short stop; Hodge a pitcher and catcher. Reynolds said that they are very interested in the players’ development not just in baseball—but their overall development.